The world of product development is changing. Globalization has offered new potentials for companies to grow their business, but also created increased pressure at the same time since global markets also create global competition. Shortening time to market is a goal almost every company is mentioning in their annual reports in one form or another. What does this have to do with Design for Manufacturing (DFM)? The main goal of this technique is to design streamlined products that allow reduced and optimized manufacturing cost which is in line with the message that designers influence the majority of product cost. Also it helps to avoid situations where engineering designs products without considering how they should be manufactured and sends designs to manufacturing and/or sourcing that they can hardly work with. Design engineers often lack tools that could help them judge manufacturability, efficiency, and manufacturing cost of their designs in a consistent way. Without those tools either they stay within areas of expertise where they feel confident to make the right decisions or they consult with process and manufacturing subject matter experts which is time consuming. Although this cross-functional exchange between departments is beneficial, it often does nothing to reduce time to market and shorten development cycles. 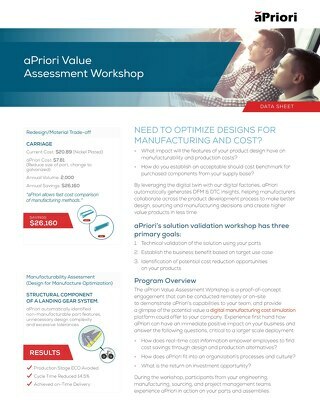 To harvest the full potential of DFM in an effective way, tools that help the design engineer consistently evaluate manufacturability and cost of different design alternatives against each other in a timely manner need to be made available to designers. 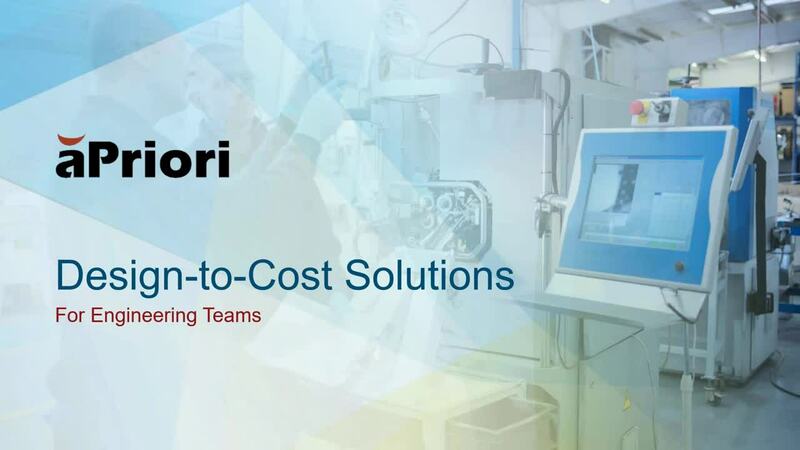 Different software providers have engaged in this field and offer solutions for manufacturing and assembly cycle time and feasibility information as well as costs. 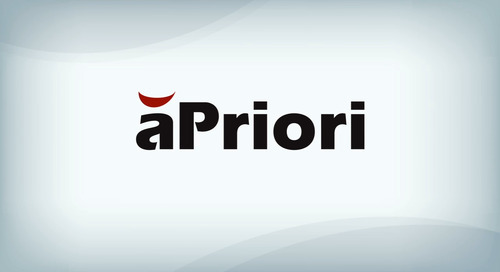 One such solution is aPriori, a leading feature based product costing software. 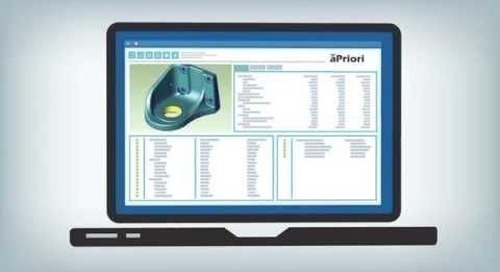 From within aPriori design engineers can access their CAD design and input some basic information about the part or assembly like annual volume, location, material. 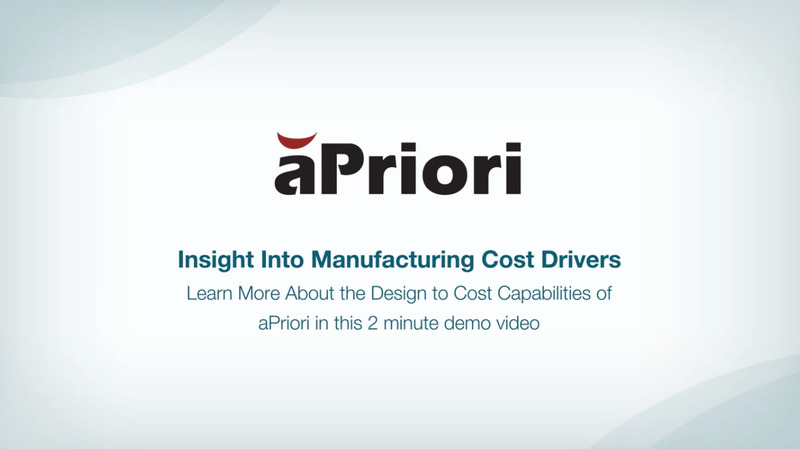 aPriori then analyzes the CAD geometry for its cost drivers within a given manufacturing process group. 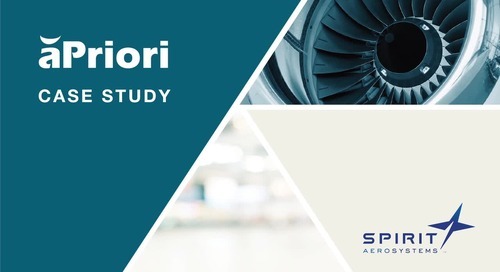 Within this process group aPriori evaluates which routings are suitable to manufacture the part and what the cycle time and material utilization will be. Another key output is the cost of the part. The entire process happens almost in real time and due to the minimized manual inputs it delivers consistent results allowing engineers to explore ideas that may not be common for them today. It reduces time to market by reducing the time needed to create effective designs and the amount of exchange between different groups. It delivers consistent results to everyone using it which avoids the same design being judged differently by different individuals. 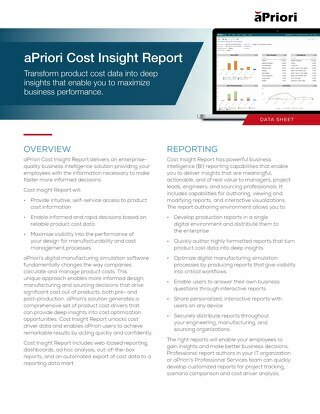 It creates important cost information that helps companies to manage product cost and launch products at or below target cost and secure margins early and fast in the design process. One of the most recent development projects at aPriori to further support DFM capabilities in a more active way is the development of a DFM analysis feature which identifies sub-optimal areas of a design so the designer gets immediate feedback, as shown in the image below, when the design is not suitable for manufacturing. 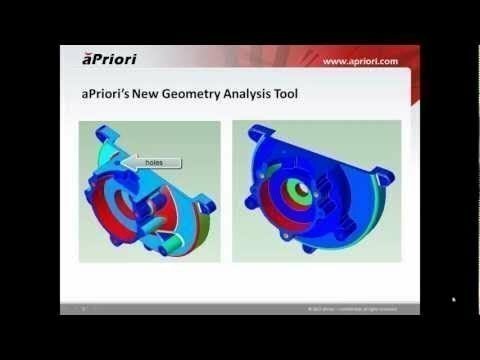 aPriori’s DFM Analysis feature highlights sub-optimal areas of a design. 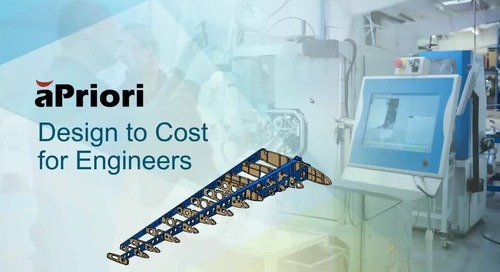 DFM helps companies design products that are easier to manufacture which results in lower manufacturing cost since the design engineer has the most influence on product cost. With the ambition to harvest the full potential of this technique, companies need to provide software tools that support their design engineers with manufacturing and cost information throughout product development. In addition to supporting the DFM technique and providing cost feedback, those tools also help reduce time during the product development process since they deliver consistent real-time feedback to design engineers to support their decisions. Do you have any experience with DFM or can you see additional benefits of either DFM or the use of supporting software tools? Tell us in the comments.